Back in May 2011, youth from around the world filed lawsuits seeking remedies against state and federal governments for failing to take action to combat the climate crisis. As part of this worldwide movement, Crag has been representing two young women here in Oregon in their lawsuit against the State of Oregon and its Governor for failing to take sufficient action to curb Oregon’s greenhouse gas emissions and protect Oregon’s public trust in our air and water. After a long journey through the lower court, on December 9, 2016, staff attorney Courtney Johnson argued the two courageous young women’s climate case before the Oregon Court of Appeals. The young women seek a court order to compel Oregon to take science-based action to address the climate crisis and prevent catastrophic and irreversible impacts. Given the lack of action at the federal level and the uncertainty regarding international climate treaties now facing the nation, this Oregon action has become even more critical. While Oregon has a Global Warming Statute, its goals are far behind what climate scientists are now calling for and Oregon admits it is not even on track to meet its outdated goals. Our fresh water, shorelines, temperate weather, food supplies and public health are on the line. 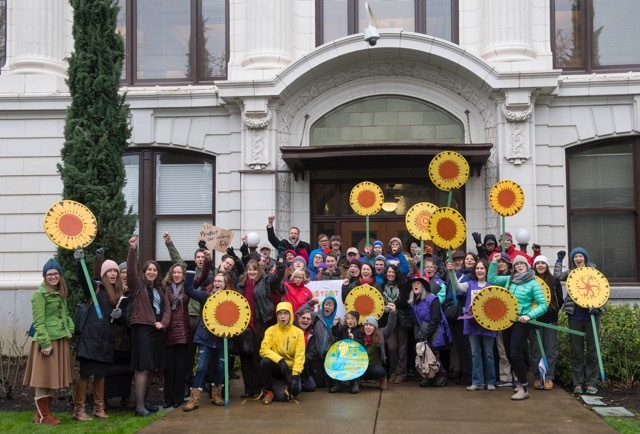 Earlier this month, Judge Ann Aiken of the U.S. District Court for the Federal District of Oregon issued a compelling opinion in a companion case and rejected efforts by the U.S. government and fossil fuel industry to block the youth’s climate lawsuit. The court authorized the constitutional climate case brought by 21 youth go to trial and gave a strong indication of its assessment of the merits of the case. The court indicated that the youth had a right to protect their air and water from the devastating effects of climate change, and that the courts could order numerous federal agencies to take action to provide specific remedies. This decision is very heartening news. We are honored to be able to represent young people fighting at all levels to protect the climate for future generations. We seek your support to be able to continue to help these youth demand a livable future! Photo courtesy of Robin Loznak.